All Riza Pasha s Government came into power on the 2 nd October, 1919. It succeeded Ferid Pasha s Cabinet. Therefore, it was the latter that proposed on the 23 rd August that Ottoman troops should be interposed between the Greeks and the national troops. And again, it was Ferid Pasha s Government that proposed on the 20 ih and 27 tn August that the territory should be occupied solely by Allied troops. Ali Riza Pasha s Government had not yet made any proposal. On the other hand, General Milne indicates the boundary of the occupied territory and orders Djemal Pasha, Minister of War, to extend the Greek troops up to this border-line . This was the command that Djemal Pasha found himself unable to obey. In any case, it is a remarkable fact that he and the Cabinet of which he was a member, after having been in power for a month, were at last able to declare to the foreign Commissioners that they were powerless in face of the national forces. As for those who do not appreciate this necessity, we would err it we assumed from the very start that they are insensitive and in different to the sacerd sentiments which it is the highest and most honourable duty of a nation and an individual to protect from assault. It is not by urgent petitions or by appealing to justice and pity that the affairs of a nation and a State are promoted or their dignity and independence guaranteed. Kemal Pasha leads them to create for themselves individually a strategical point of support in Turkey upon which they can rely. The neutral attitude of the Government discourages them. To this fact we must attribute the cause of the hostility and dissatisfaction shown by the foreigners , as well as the weakness of the Government that have not the country behind them. 2. The Government must not be in too great a hurry to publish their declaration. It must not be published before the position of the Cabinet has been established. The Cabinet can have no strength unless they pursue a course which carries the conviction that they rely entirely on the national forces, and unless they publicly declare their identity with these forces and proclaim the fact openly before the whole world. When the Chamber has met and a strong party within it is com posed of adherents of the Defence of the Rights, it will be time enough to think of giving explanations. In any case, it must be drawn up before the departure of the Peace Delegation, in co-operation and in accordance with such a party. For, without this co-operation it would be of no use at all. Besides, it would be altogether wrong to begin with a list of the reforms which it is proposed shall be carried through. On the contrary, the main consideration, namely, the independence of the nation and the integ rity of the country, must be put forward from the very first ; then the proposed administrative reforms will come up later automatically for discussion. The manifesto issued by the General Congress at Sivas and its regulations contain very important guiding principles, and on them this statement can be based. Accurate indications of the future frontiers, the independence of the State and Nation, the rights of minorities, the interpretation that the nation puts on the expression “foreign help”, are all referred to in them. A statement on these lines can be prepared at once, but it must not be published before the Chamber has been opened and until union with the majority in power has been effected. This is the procedure that must be adopted. 3. We can see no reason why the resignation of the Minister of the InteriorvShould lead to a crisis in the Government. You give the impression that you look upon the Minister of the Interior as being the Grand Vizier, because it is only the resignation of the Head of the Government that produces a crisis. 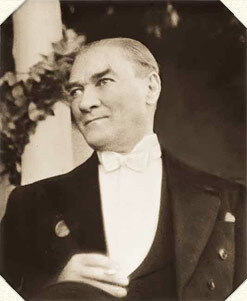 The impression is given that the Cabinet falls with Sherif Pasha and that he is dependent on Ferid Pasha. We cannot understand what you mean when you say that a change in the Ministry of the Interior and the Ministry of Foreign Affairs is certain to occur when Parliament is opened. Have these Ministers already threatened to retire then? It is quite natural that our enemies are doing all they can to prevent the Chamber meeting. But ought the Sovereign to allow himself to be used for the dissolution of Parliament? If this is at all probable, we would have assembled Parliament in Constantinople merely for the purvose of dissolving it and leaving the nation without a Parliament. Consequently, it is very important that we should be accurately informed of the intentions of the Sovereign concerning this probability at once, in order that we can make arrangements for the deputies to meet in a safe place outside Constantinople. If the Chamber meets in Constantinople and this suggested fate should befall it, the responsibility will rest on those who insist that it shall meet in Constantinople. 4. It would be better if the deputies came to Angora to discuss matters with us. I felt it my duty to get into closer touch with the honourable inhabitants of Angora, who had received me in such a wonderful manner and had shown me such really sincre and encouraging sen timents, and discuss the questions of the day with them. I will tell you as quickly as possible what we talked about at this meeting.